The Czech Republic was the only EU member apart from Britain to refuse to join the so-called "fiscal pact" to enforce budget discipline. The country must adopt the euro at some point in the future, and is proud of its own fiscal prudence. So what lies behind Czech reticence to sign up? 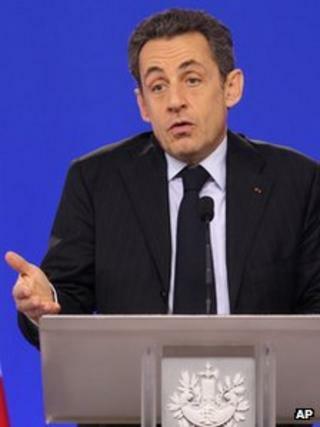 Nicolas Sarkozy says he does not understand Czech politics. He is probably not alone. "The Czech PM told us that for constitutional reasons he did not feel he could accede to the future treaty," the French president told reporters in Brussels. "I'm not sufficiently familiar with the ins and outs of what's going on in Prague to understand why what was acceptable in December is not acceptable now. "It will be a treaty among 25," Mr Sarkozy said, explaining that a Czech "maybe" had morphed into a Czech "no". A few hours later the Czech Prime Minister Petr Necas himself appeared before reporters to explain why the Czechs had said no. There were, he said, three central objections: limited access to eurozone summits for those EU members who don't yet use the euro; a failure to properly address Europe's debt crisis; and the ratification process in the Czech Republic, which Mr Necas freely described as "very complicated and uncertain". He is not wrong there. The country's influential - and Eurosceptic - president, Vaclav Klaus, has already told Mr Necas he will not sign Czech accession to the fiscal compact. So even if the Czech prime minister wanted to join it (he doesn't), the president would not let him. A further complication is that last week Mr Necas pushed through a government decision that joining the pact could be approved by a constitutional majority or by the Czech people in a referendum. That, said critics including his own cabinet colleagues, was disingenuous; even if the Czech people were in favour of more budgetary oversight from Brussels (they are not), simply organising a referendum could take months, possibly years. Certainly it cannot be done by March, when the fiscal compact is supposed to come into effect. The outcome of a constitutional vote is similarly unclear and anyway would be preceded by months of acrimonious debate in both houses of parliament. No wonder Mr Sarkozy is confused. Some, like the Czech foreign minister Karel Schwarzenberg, are both confused and angry. He told reporters: "Everyone understands why the UK is against the pact. No-one understands why the Czech Republic is against it." If, however, you have the time, patience and the inclination to delve deeper into the real reasons behind Mr Necas's refusal, the picture becomes clearer. The reasons actually have everything to do with "the ins and outs in Prague". Nicolas Sarkozy hit the nail on the head. For Mr Necas's Civic Democrats, like Britain's Conservatives, Europe has often proved a divisive topic. Like the Tories, the Civic Democrats have a right-wing, deeply eurosceptic faction and a more moderate centre. Mr Necas, like David Cameron, is above all a pragmatist; a moderate who must balance the interests of party, coalition and state. He must play to the Eurosceptic gallery and yet do just enough to keep his country from being sidelined in Europe. And he must do all this in an election year - senate and regional elections in which the Civic Democrats are expected to perform disastrously. Thousands of centre-right voters have already deserted the Civic Democrats in favour of their coalition allies, Mr Schwarzenberg's mildly pro-European TOP09. Ultimately, as Mr Schwarzenberg points out, the Czechs may be left with no option but to sign the compact anyway. Under the terms of their accession treaty, all new EU members must adopt the euro, and under this latest treaty, all euro members are expected to sign the fiscal compact. "Mr Necas is just looking for an alibi - the Czech Republic has no Plan B," says Jindrich Sidlo, a commentator for the leading financial daily Hospodarske Noviny. He explained that defending a decision to sign the fiscal compact would be politically impossible for the prime minister. Even though, in the end, it is a decision that some Czech prime minister will have to take.